Transplanted from a site destined for bulldozing, my trillium have thrived in my urban garden. Worry is like rocking very fast in a rocking chair. It takes a lot of energy and you don’t go very far. I spent this winter worrying. Not a big worry, but it occupied my mind throughout the dark time of the year. I was worried about my trillium. 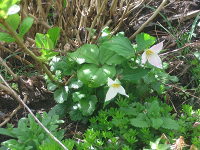 About 15 years ago, a friend invited me to come dig trillium in a forested area that was scheduled to be bulldozed for a new housing development. I brought home nine huge plugs of forest floor which I placed into nine huge holes in my backyard. Trillium are not easily transplanted. In fact, they are quite persnickety about being messed with. If they are carelessly disturbed, they will not bloom again for up to nine years - if they survive at all, ... hence the huge plugs. I was very careful and the following year seven bloomed. I was ecstatic. Every spring, I begin anticipating their appearance in early March, counting each one as they emerge. Last summer I hired a landscaping crew to weed my garden while I was away for six weeks. I knew if I wasn’t proactive I would come home to an out-of-control jungle that I would be fighting for years to come. 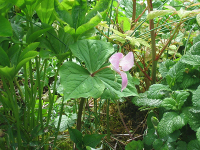 When I returned to my beautifully groomed woodland garden, I discovered that all the trillium leaves had been pulled along with the weeds. Horrified and feeling guilty that I had not taken the time to build walls around each precious plant, I worried all winter. I was sure they were gone. In early March, I began my vigil, watching for any sign that even one had survived. It wasn’t until a week ago that I spotted the first one. Over several days I prowled the garden, hoping. Then, there were two, ...three, ...five! Days went by. At last, this morning I spotted number six and, unbelievably, number seven. They all came back! I celebrated by doing the Trillium Dance! It is tempting to build protective walls around my rescued ‘wild’ flowers, but I think I won’t. Their wildness is what draws me to them and the early spring adventure of searching for them is part of their magic. However, when you visit my garden, watch where you step. The Trillium Dancer has an evil twin. Reminder: The temptation is great, but you are not allowed to dig wildflowers in our beautiful forests. Enjoy them where they grow.